Nutella is a passion for people that almost borders on being a cult. We have entire category dedicated to Nutella posts. It started with everyone trying to find the perfect Nutella knife that fit the jar nicely. We still recommend the Wusthof Gourmet 5-Inch Spreader as the more practical option. 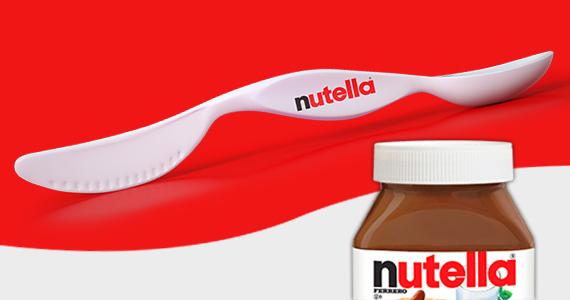 The spife awarded as a prize by nutella appears as more gimmick than a much needed piece of cutlery. I would appreciate something more efficient in getting around the bumps and curves of a nutella jar. Of course, this could be done with a reconfiguration of the jar. That’s not going to happen, so I’ll be still using a smaller version of a spatula, to get the hard to get places.